While we are making our fashion website template list, we came across many discussions from small store owner for mockups to showcase their materials. Of course in our eCommerce store list, we have mentioned that original pictures get more attention than stock ones. But making quality photographs of a product will consume lots of time and resource. That too if you are running an apparel store you need to search for a suitable model as well. So in this list, we decided to help both store owners and designers with these thirty free t-shirt mockups in this list. 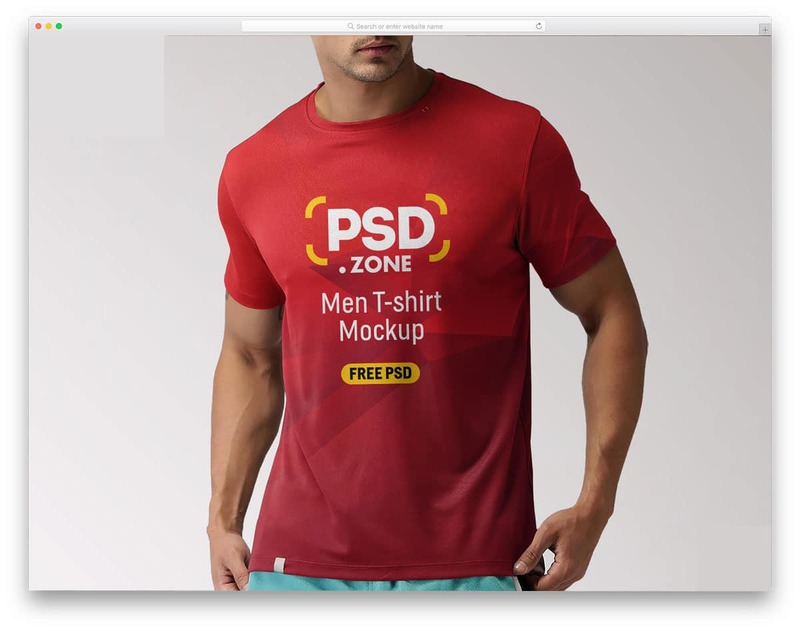 All these free t-shirt mockups are build using Adobe Photoshop, so you might be needing an editing tool like Photoshop, Affinity or anything related to it. 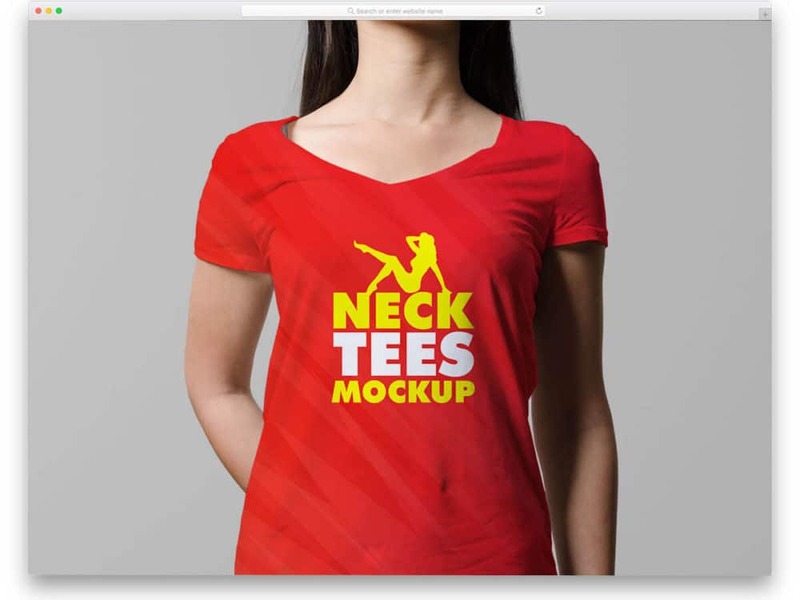 We have listed both t-shirt mockups with models and show quality t-shirt mockups. All these free t-shirt mockups will reduce your work immensely, all you have to do is to replace the existing text or images with your own design, simple as that. Saying that, let us get free t-shirt mockups. 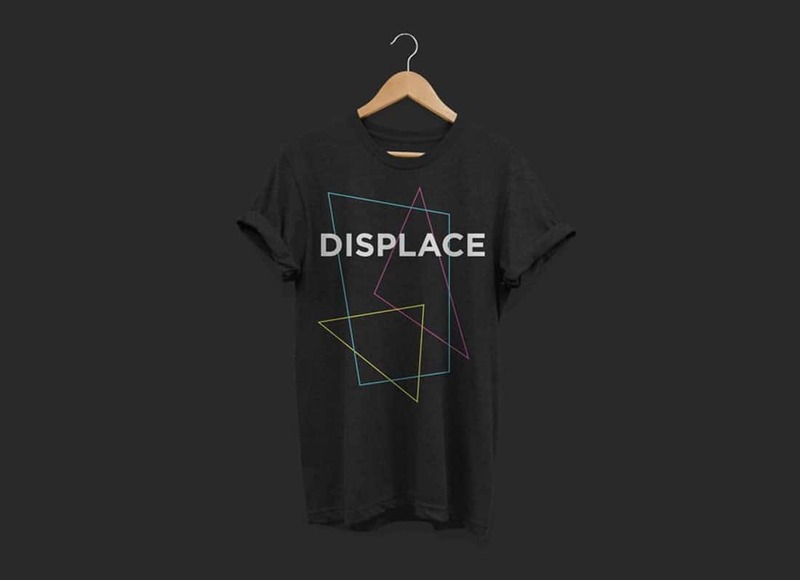 In this free T-Shirt mockup you get a single t-shirt image. It is an isometric image with a clean background. The whole t-shirt is masked by one smart object, hence you can easily add your design on this t-shirt. PSD layers are organized properly for quick access, in no time you can click a layer you want and start editing it. The undulations on the t-shirt are preserved well on the mockup to give a realistic look to your design. Round Neck Men T-shirt Mockup, as the name implies, in this mockup you get a round neck t-shirt. Only one image is given in this free t-shirt mockup, but the customizations are made simple like in the premium mockup. 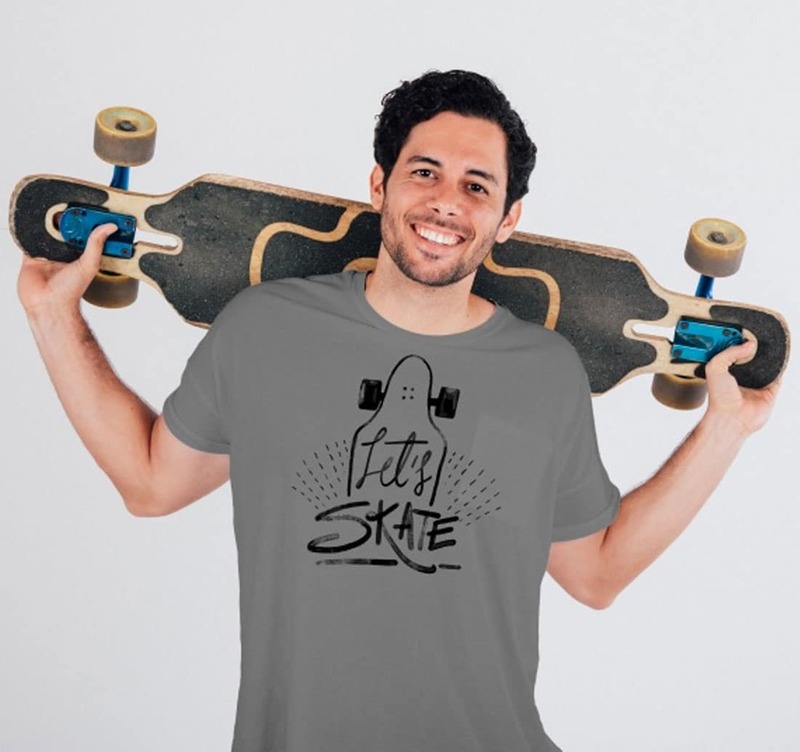 Since this mockup includes a male model, the curves and foldings on the t-shirts are preserved well in the photoshop layers. Properly handled layers deliver a realistic image, so your design looks surreal on this mockup. It is a high-quality image so you can scale them to the size you want. You can even use this mockup for printing purposes and banner purposes. Take a look at our banner mockups to elegantly promote your banner designs. If you are making designs for your stores, then branding them is a must. Making good design is a must but showing your brand clearly will increase your brand awareness among the other customers. For those brand focused stores, this mockup will reduce your time immensely. This mockup clearly shows your brand on a folded t-shirt. You can change color and the background image easily. Even if you are Youtube celebrity or an influencer and want to sell your own merchandise, then this mockup will help you share the preview images on your social media accounts. It is a PSD file, so working with it will be a piece of a cake job. This is a high-quality image taken in a perfect studio lighting condition. So you can edit the mockup easily to your taste. All the layers are blended well so no matter you add to the mockup, it is shown clearly. This mockup can be used for the eCommerce stores as well. As most of the online buyers love to see the product in a different angle before buying them, these multi-angle images will help you a lot. In the demo, the designer has used only text design, but you can add any type of design you like. This mockup is also from the same creator of the Male T-shirt mentioned above. If you want the same image quality with a female model, this one will help you. 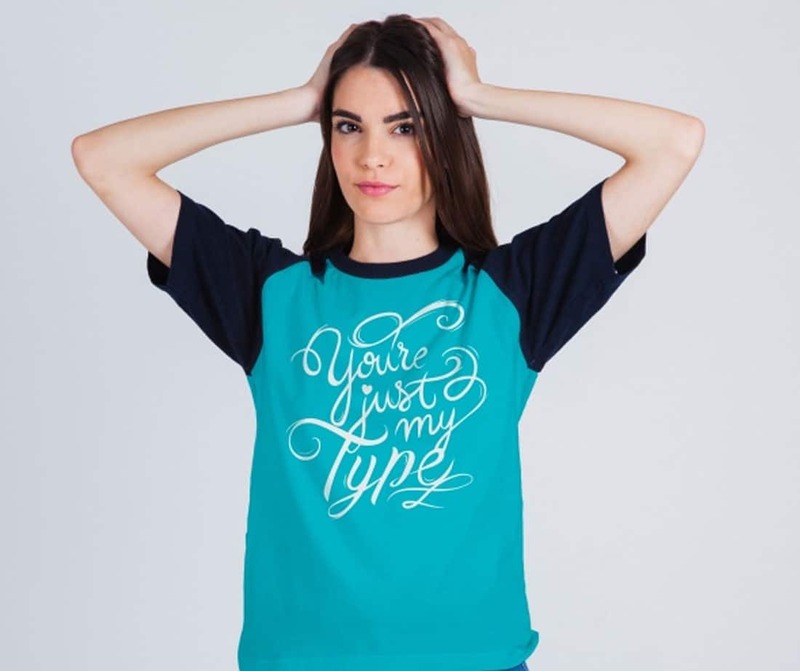 If you are planning to make a special sale for valentine’s day or take special orders for events apparel with the same design for both men and women; these two mockups can help you. 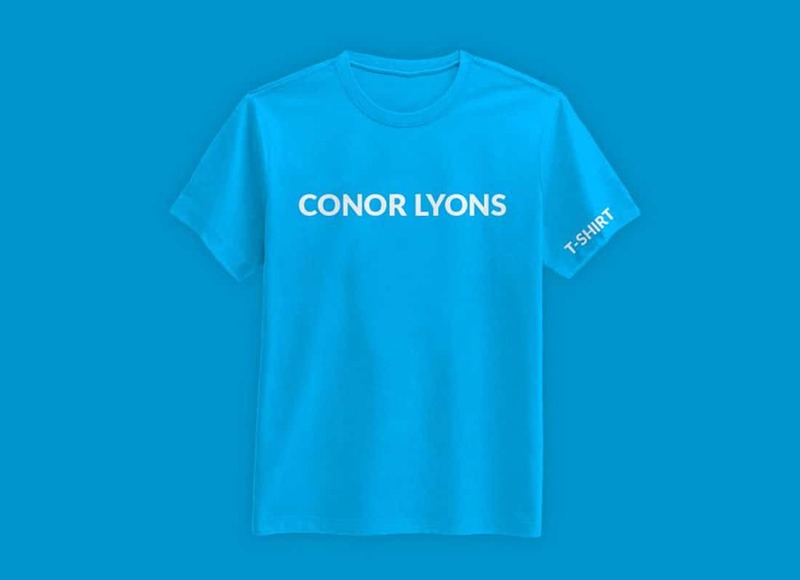 Like the above t-shirt mockup, this one is also shown in different angles so the users can have a better look before buying one. In order to download this mockup for free, the creator expects a small favor from you; you need to share this in the social media. Other than that, it is completely free to use. 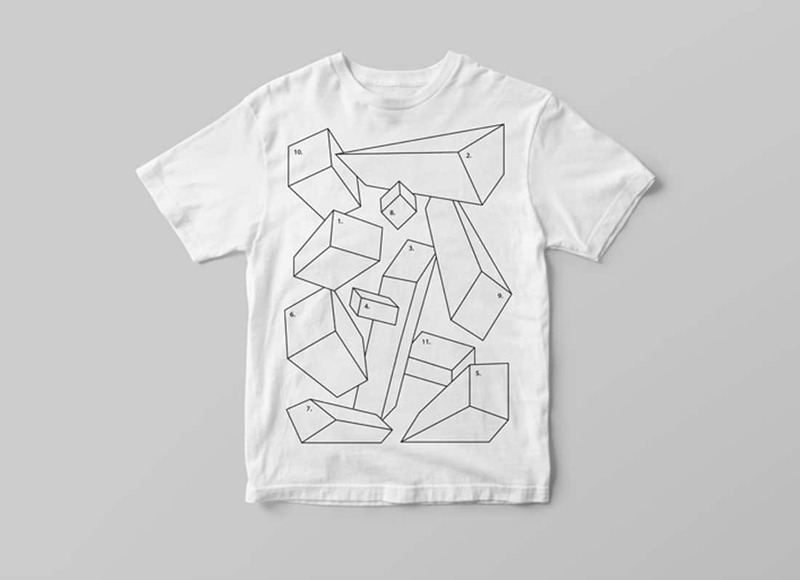 If you are looking for a casual looking model mockup for your t-shirt design, then this is the one for you. 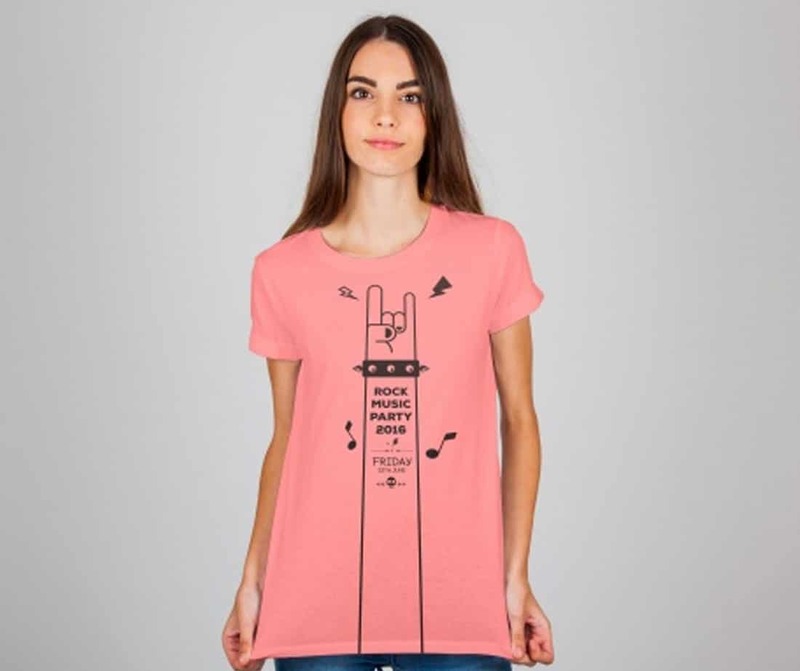 Rather than submitting your design on a simply folded t-shirt mockup, you can use mockup with the model so that the user can get an idea. All the layers and lighting effects are taken care on this mockup. You can simply add your design and showcase it without any issue. It is completely customizable so that based on your design, you can change the mockup to the color you want with a few clicks. 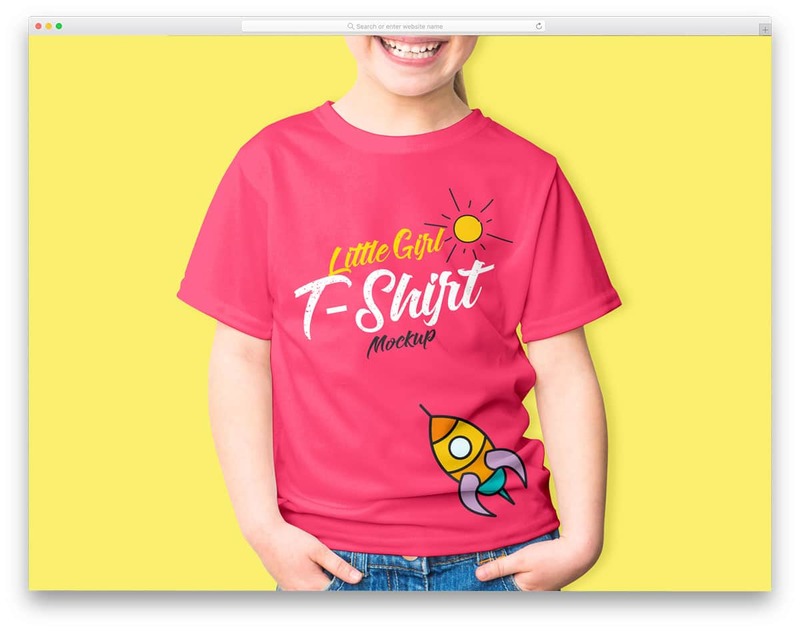 We have seen a lot of t-shirt mockups for adults, this particular mockup is for kids. Since this mockup is designed for kids, you have bright colors by default. But you can change it to the colors and designs as you want. The creator of this mockup has made it perfectly fit for all types of designs like the full body design, chest design and lot more. This mockup has more than enough resolution of 4000×3000 pixels. So no matter how big your design file is, you can easily fit it into this mockup without any issue. You can also shrink it to the normal size without any loss in the quality. 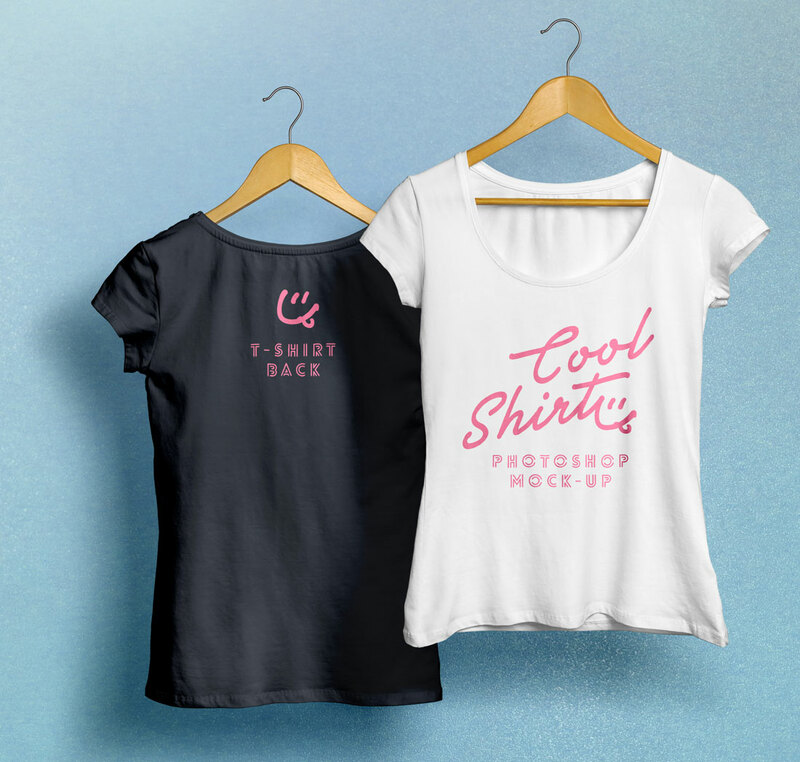 Woman T-Shirt MockUp PSD is a product showcase type mockup. The designer of this mockup made your job easy by using several layers. The layers are made very realistic so that no matter whatever text or graphics you add to the t-shirt, it will look like an original piece. This mockup includes both front and back design, so you can showcase your product neatly. To edit this mockup you need at least CS3 photoshop version. 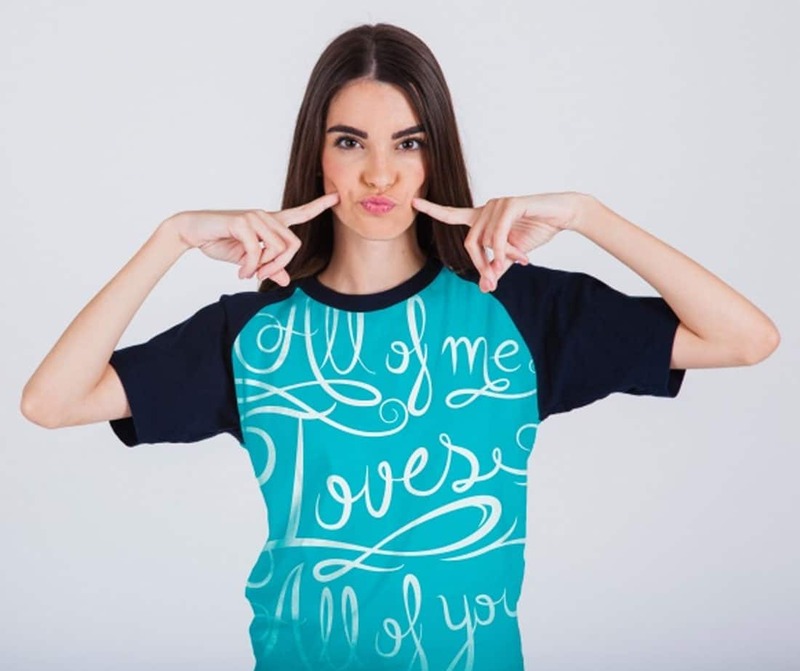 T-Shirt MockUp PSD is from the same designer of the Woman T-shirt mockup mentioned above. In the previous design, you get two color option, with this mockup you get only one color option. Since the mockup design is developed using different layer, you can almost change every aspect. The main graphic element is used as a smart object, all you have to do is to change the existing design with your own text or design. This showcase quality mockup gives you both front and back design of the t-shirt. 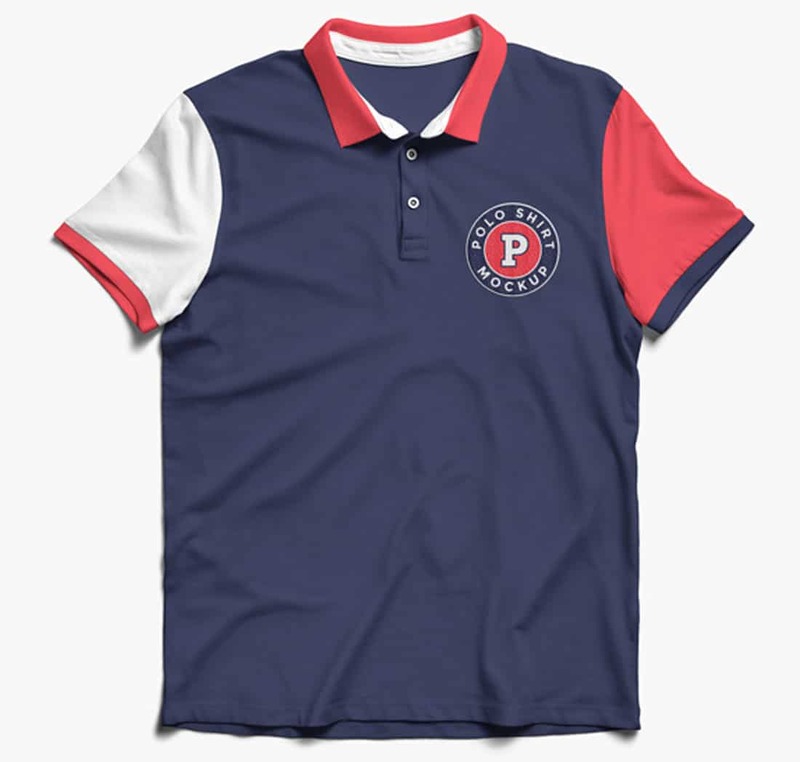 Polo shirt mockups are rare under the free category. But this designer has given an extraordinary premium quality mockup for free. The high-quality image looks real and the lighting is also great so that you can display your t-shirt elegantly. In the demo, logo design is placed on the left sleeve, but the designer has made this mockup smart enough to handle both full body design and sleeve design. With this mockup also you get both front and back design of the t-shirt. To edit this mockup you need at least CS4 version of Photoshop. 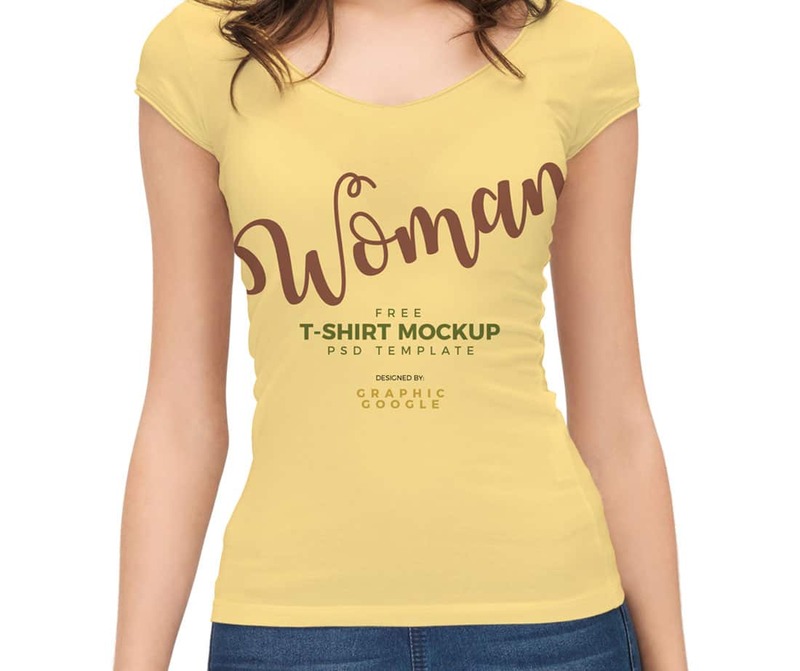 This woman t-shirt mockup design comes with a hanger to give a more realistic look. The designer had made the mockup look surreal with the shadow effects. 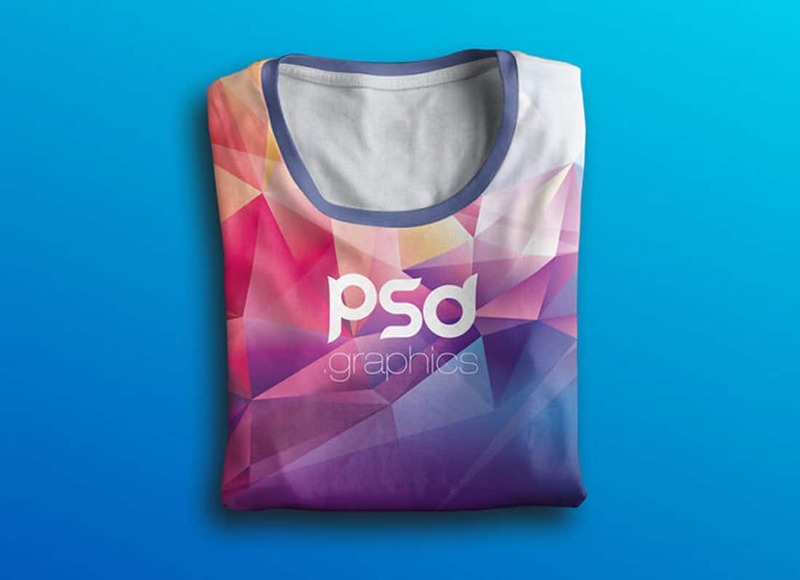 Layers of the mockup are made to blend well with the t-shirt design to make sure that whatever graphic or text you add, looks perfect in the design. The default design of the mockup includes black and white color, but you can also change the t-shirt color based on your needs. Long Sleeve T-shirt mockup gives you a photorealistic view. In the default mockup, you have a scratched wooden desk like background. But you can change the background style as per your need. With this mockup, you can showcase two t-shirts at a time. To edit this mockup you will need a Photoshop CS4 version. If you are looking for a full body long sleeve t-shirt design that has a realistic effect, then this the best mockup for you. 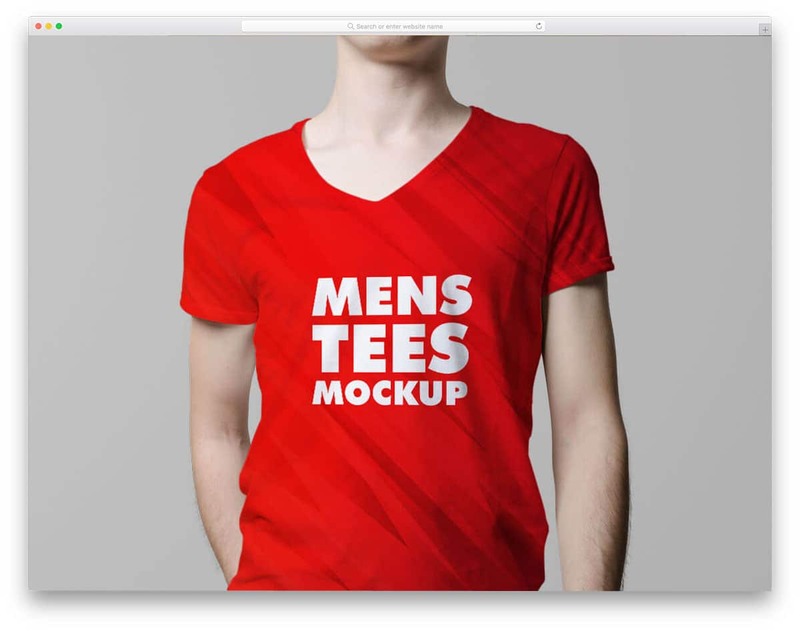 If you are selling a set of t-shirt with different colors, then this V-Neck T-Shirt MockUp PSD. With this mockup you get three t-shirts placed one over the other. All three t-shirts have separate layers and smart-objects so that you can easily customize each t-shirts design. This mockup gives you both front and back view for a better view. In order to edit this mockup, you will need at least CS4 version of Photoshop. 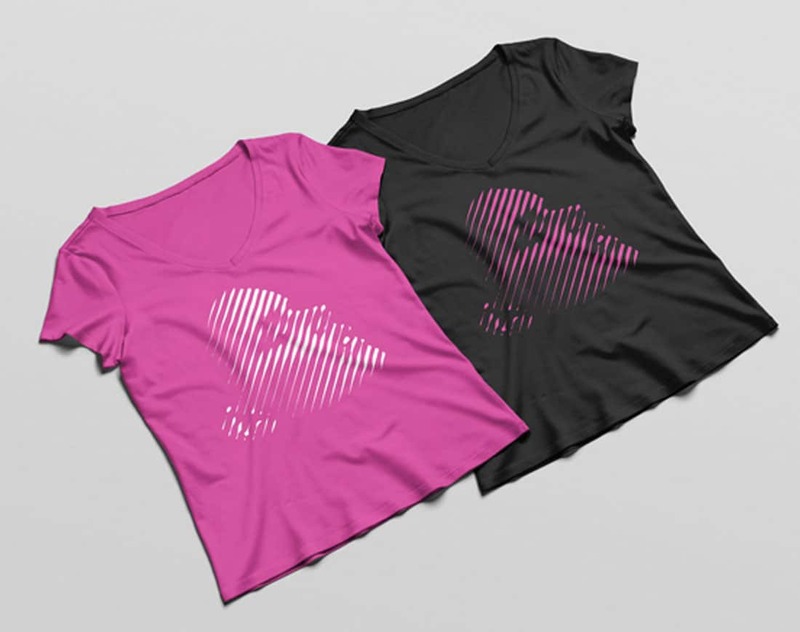 This round neck t-shirt mockup helps you to make your design look realistic. The designer has made this mockup flexible enough so that you can change almost all aspects of the design. With this mockup, you get only one angle view and front side alone. You can change the color of the t-shirt without any issue and the graphic design is kept as smart-object. All you have to do is to replace the existing design with your design and showcase it on your site. This mockup is especially for web designers, especially if you are designing a portfolio website template you might need many colorful designs. This Men’s round-neck T-Shirt Mockup is the most colorful ad quality design. 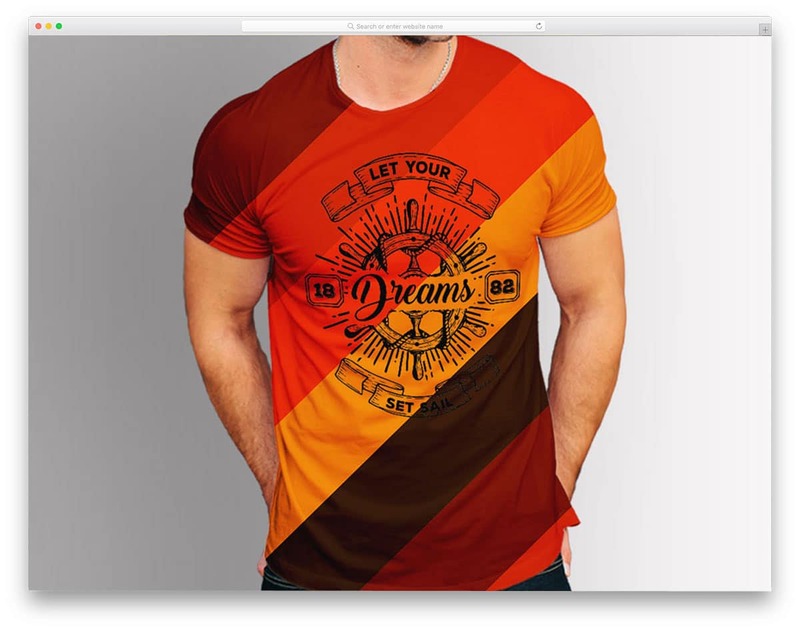 The designer has given you full-freedom to change the entire design of the mockup, you can change the color of the t-shirt as well as the background. Smart objects are used for the design placement for easy editing. Sometimes it is better to show your product in all possible styles. In the stores, most of the t-shirts are kept in a properly folded condition, with this mockup you can do that in your e-store also. On the clean background with trendy colors, the product looks real and the t-shirt design is clearly visible without any disturbances. If you want you can change the design of the background. Properly arranged and labeled layers help you easily identify the objects and customize them. Packaging plays a key role in the product marketing. With the packaging design itself, you can make the people feel your brand quality. 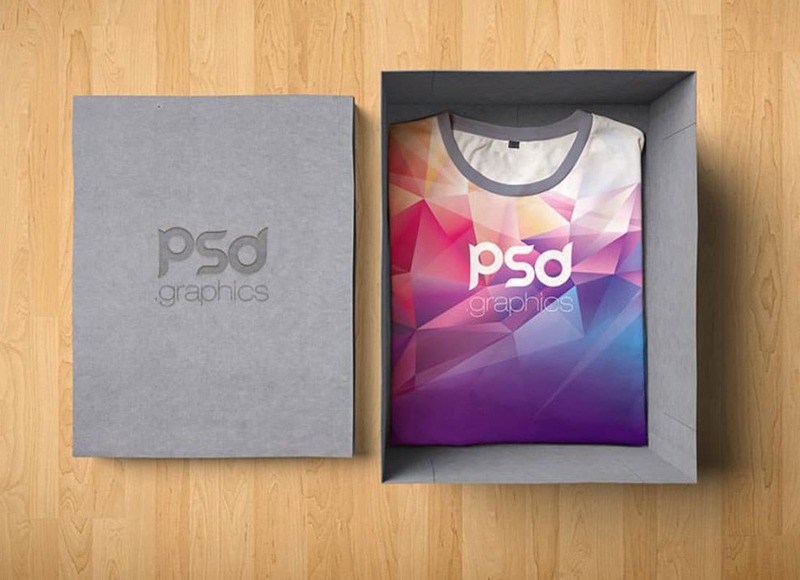 This T-Shirt Box Packaging Mockup will help you show your t-shirt design folded in a box. 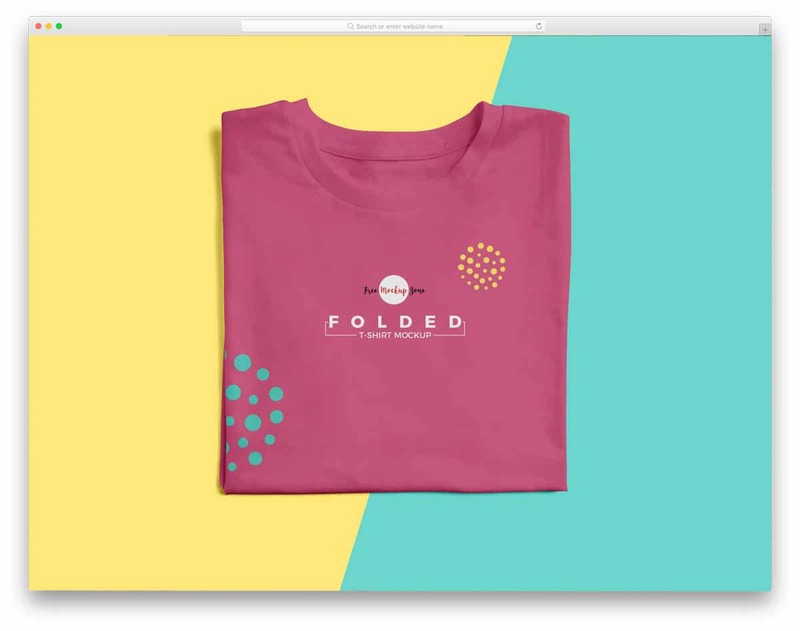 This mockup is also from the folded t-shirt mockup mentioned above, so you can expect the same design quality and user-friendly editing option. In this mockup, you can also change the logo on the packaging box. Folded Psd Sweatshirt Mockup gives you complete control over every element of its design. 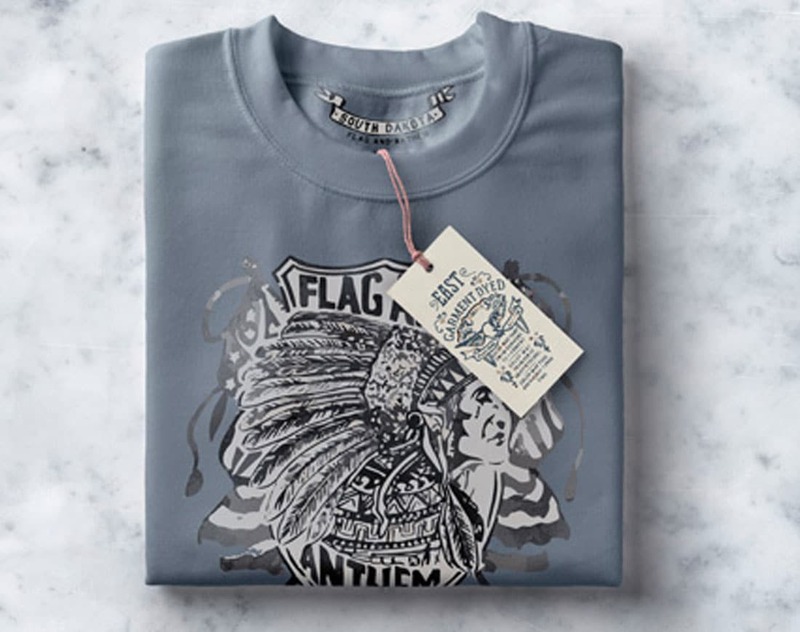 Right from the t-shirt to the tag, you can customize everything and can add your brand label. The high-quality image gives a realistic feel, and the designer has also blended the layers well within the real photographs. You can easily customize and change the mockup with your design. In order to edit this mockup, you would need at least CS4 version of Photoshop. This is another neat looking realistic t-shirt mockup. In the default demo this mockup uses text design, if you have any other abstract design it will look great on this mockup. Personal brand focused apparel sites can use this mockup to increase their brand visibility. The smart object layer is created with accuracy to meet the natural effect in the image. You can straight away put your design on this mockup and can add it to your store. 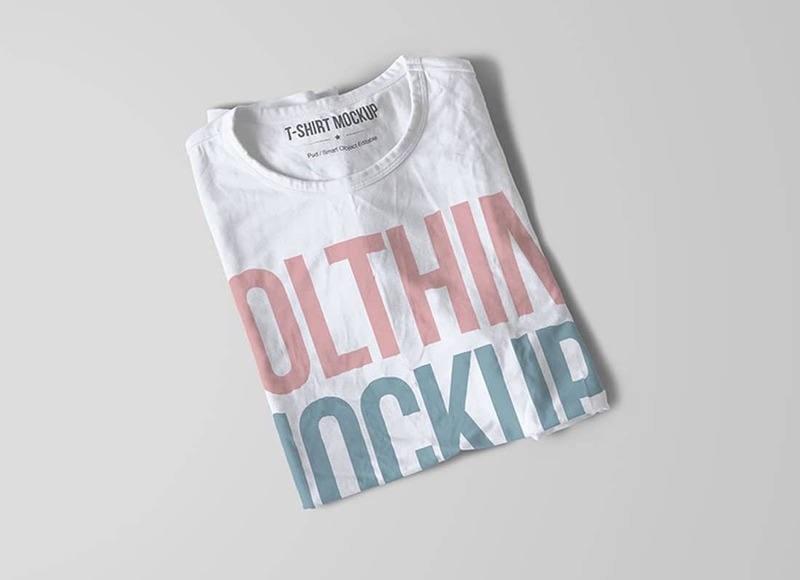 Free T-Shirt Design Mockup is a premium quality freemium type t-shirt mockup. When a product is mentioned freemium, there will be a catch point. In this mockup, you can use this mockup for free, but you have to attribute the creator of this mockup. Other than that design wise you get a perfectly natural looking mockup. The customization is also made easier with smart objects and proper layers, you can add your design easily within a click. To give a more natural and casual look to your t-shirt design, this mockup includes a rolled up sleeves. With the plain dark background and hanging posture, this mockup will give a better visibility to your t-shirt design. The smart object design of this mockup is done exceptionally well that matches with the fabric of the t-shirt. So you get a real t-shirt design feel even when the user zoom in. 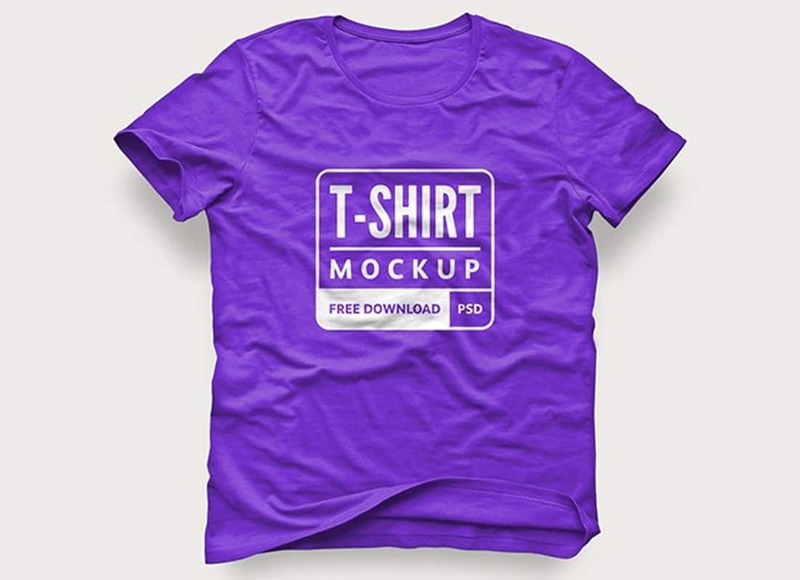 Like most other free t-shirt mockups in this list, this mockup also allows you to change the color of the t-shirt and background. Sometimes you no need a model to show your apparels elegantly. Instead, you can use the 3D design, which is more cost effective and is also easy to handle. The designer of this mockup made your job, even more, simpler with his design. 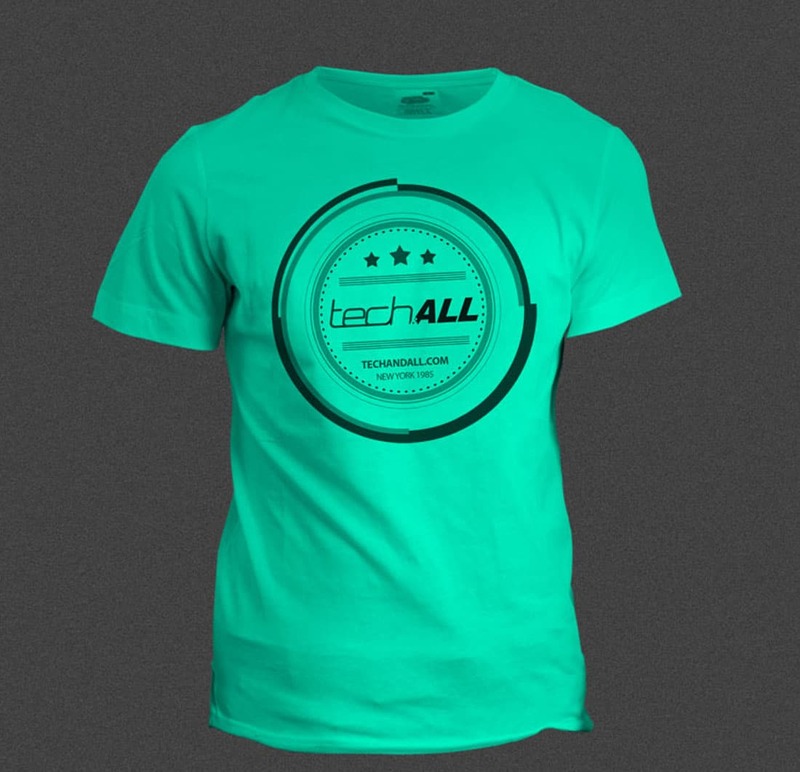 With the neat design, you can highlight your t-shirt design easily. You can change the color of the t-shirt and background as you want. Since this mockup is done using latest Photoshop version, make sure you also have the version close to the current version. We had enough look at the showcase type mockups, let us start looking at the mockups with the model. 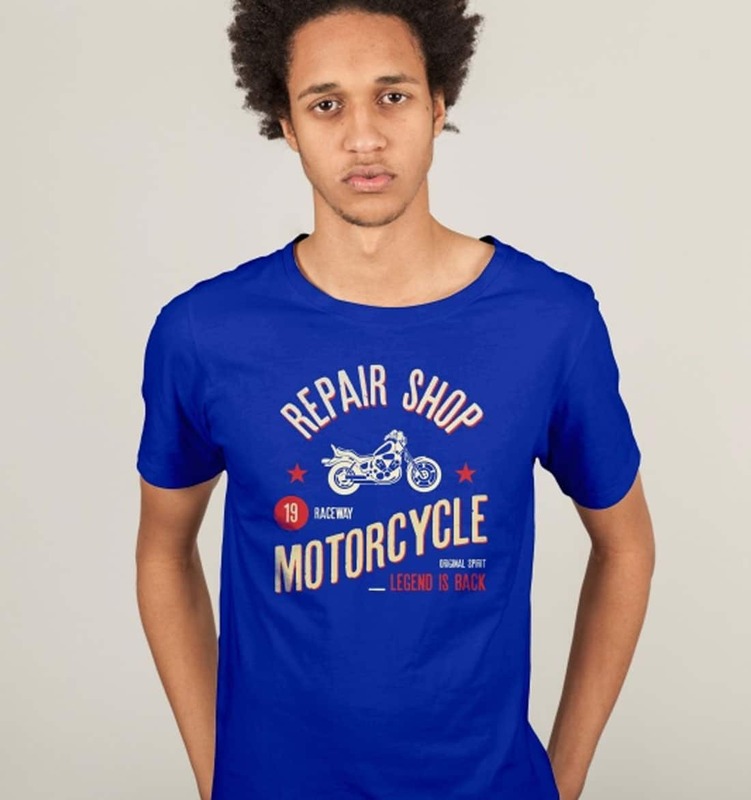 The following graphic fuel t-shirt mockup gives you t-shirt model mockup with a clean background and with images. On the clean background, the image looks natural but in the image background the mockup looks a bit artificial. The smart object is done with care to make it look natural. Since the model is wearing a headphone, the smart object segment is aligned perfectly to match the original result. 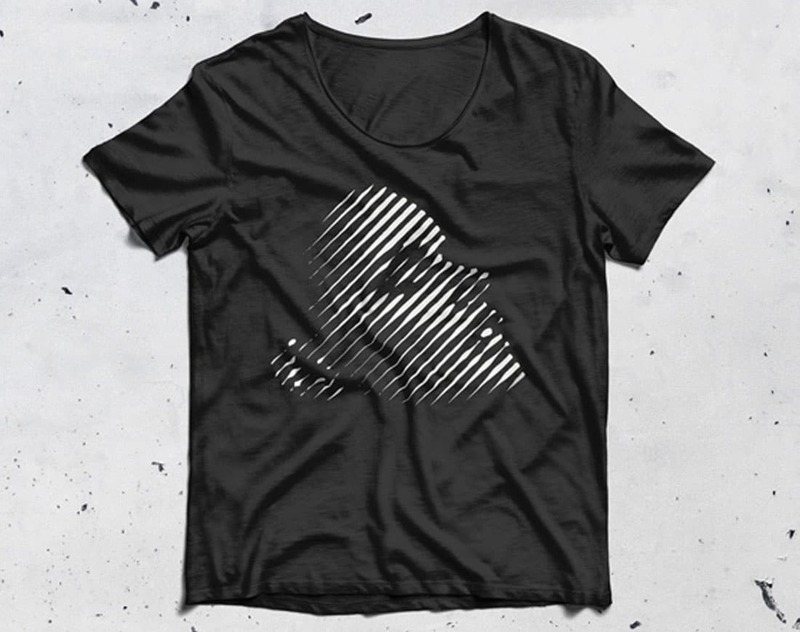 The following women t-shirt mockup is also from the graphics fuel team. It is a high-quality mockup with clear segmentation of layers and smart objects. If you are looking for a wool-like material t-shirt mockup, then this is the one for you. The smart object part is designed to give utmost perfection to the dress material, but yet at certain areas it looks bit artificial. Other than that it is a perfect mockup with full options to change the colors and other design attributes. This t-shirt mockup gives you a more realistic view. One can’t easily find the difference between the real world element and the graphics element. The designer has given you multiple choice to edit and also done all the adjusting work for you with the help of different layers. You can add graphics rich work as well as minimal designs, this mockup can handle it easily. Since this mockup is done using latest photoshop version, make sure you have latest or closest iteration of the Photoshop software. From the design itself, you can see that this mockup is also from the same designers of the version two mentioned above. The designer has taken the toughest part of making the mockup look real with the sunlight. Other smart objects are also included in the downloaded packages, so website template designers you will have more model options to choose from. This mockup can handle both full body design as well as sleeve designs. Most fashion stores are nowadays looking for a lively model image in their sites. If you are also in search of such lively model for your apparel design, then this the mockup for you. This studio-quality image gives you clean design and gives you all the feature to elegantly display your t-shirt graphics. At certain areas, the design looks bit artificial, but it is very minor, one can’t find it easily. This mockup is designed with latest Photoshop version, so you get more realistic effects. This t-shirt mockup includes two models. When you are running shopping festival on your apparel store mockups like these will come in handy. The perfect lighting condition on the pic made it easy to edit both models t-shirts easily. Layers and smart objects are also used effectively in these mockups so that it reduces your editing work immensely. All you need to do is to customize the mockup with your original designs and brand names. More casual looking t-shirt mockup. This fresh new mockup is a new entry in the free mockup world. With the natural looking t-shirt mockup and perfect lighting, this template will help you showcase your design elegantly on your site. The designer has shared high-quality image, so even you can use this mockup for ad banners and other types of printing uses. This mockup also gives you complete control over the design, you can almost change everything in this mockup. This t-shirt mockup also uses the same model as you have seen in the sixth variation mentioned above. By using the same model with different poses you can make a consistency throughout a product lineup. 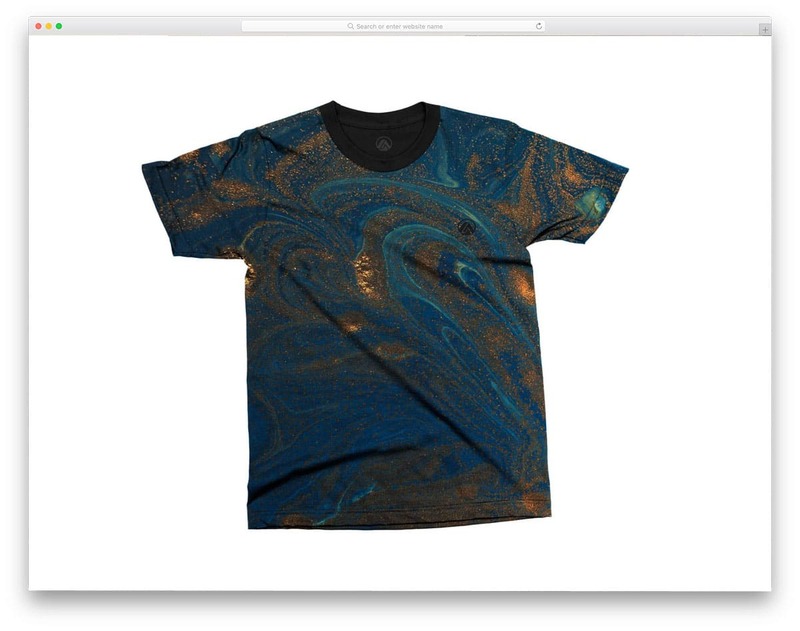 With the clean background, this mockup highlights your t-shirt design elegantly without any distractions. The designer has used latest Photoshop version to create this beautiful mockup, so you might need Photoshop version close to the latest version to edit this mockup easily. With the pulling down t-shirt pose, this mockup helps the user to get a better view of the full design of the t-shirt. 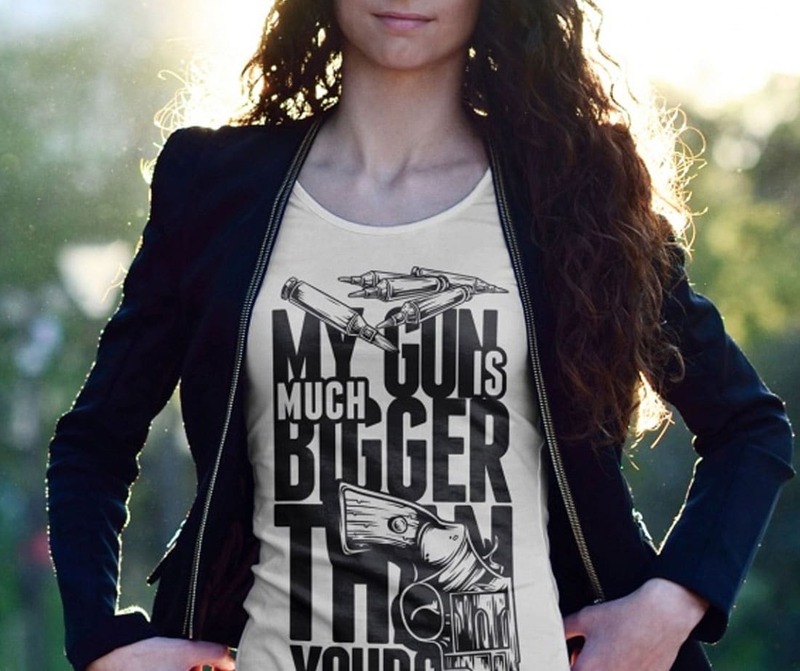 If you are making a full body t-shirt design, this mockup would be the best choice. This mockup can handle both simple abstract design and complex artistic designs. The designer had taken care of all the layer adjustment work, all you have to do is to replace the existing design with your design. 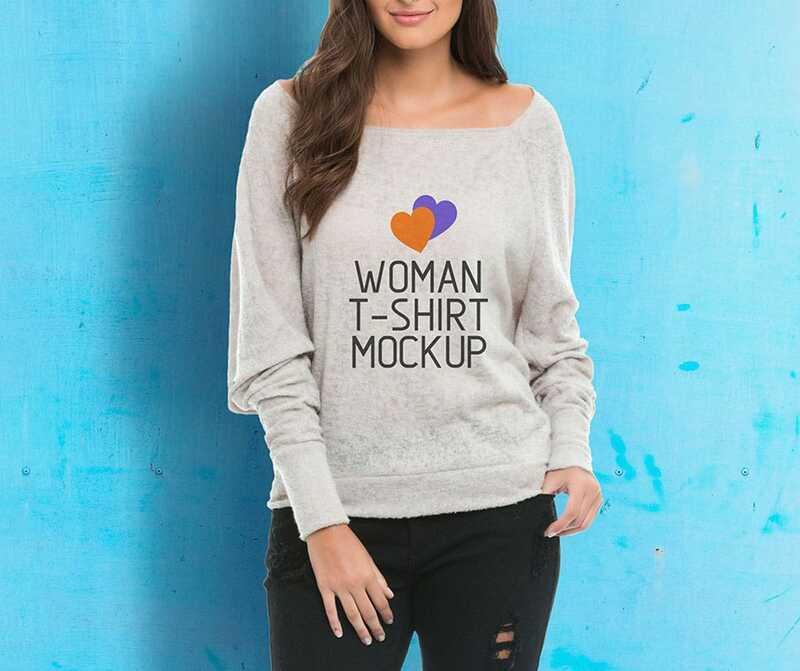 This is a plain simple women t-shirt mockup. The designer had given you the option to add single colors, multi colors and split colors. If you are using some other colors other than the colors used in this mockup, you can change it easily. The mockup doesn’t look so natural, at some spots it does look like an artificial layer. If you are using it for design showcase, then it is well and good but for store owners, this won’t be the best choice. 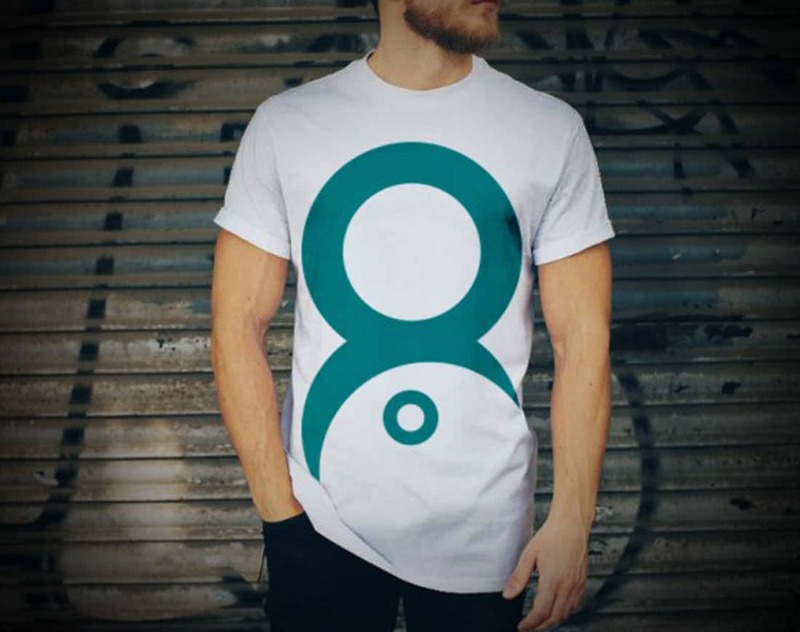 This round neck men’s t-shirt mockup is created perfectly for professional use. The photograph in this mockup is taken under perfect studio lighting condition, so you get a clear high-quality mockup. 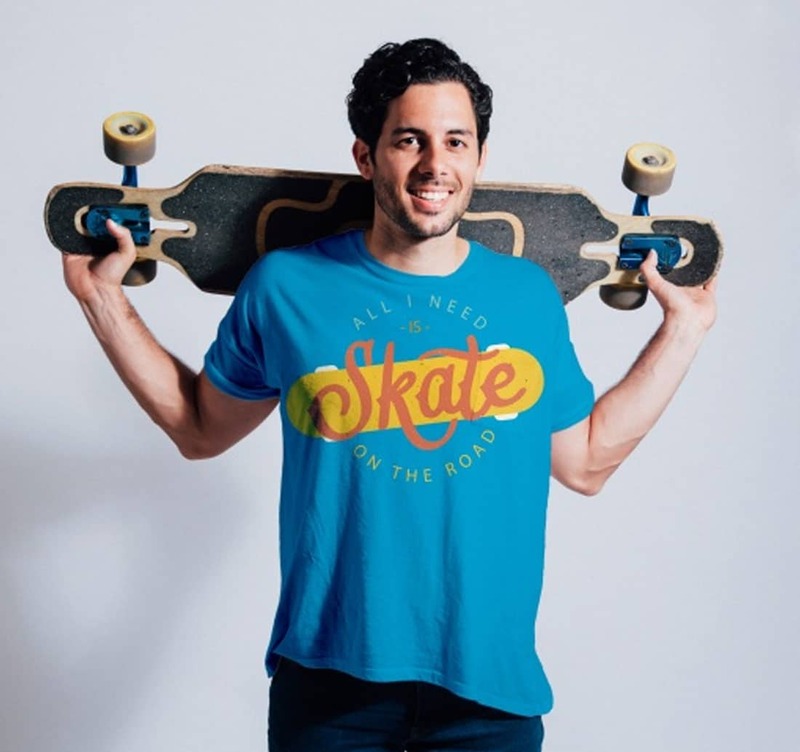 You can not only change the design of the t-shirt, the designer has also given you the option to change the color of the t-shirt and the background color. You can even use images as background, but for more natural look go for a clean background. This mockup is designed like character interacting with each other. Mockups like this can be found easily on premium sites like Shutterstock, but it is quite difficult to find in a free category. Lucky for you we find this premium quality mockup. 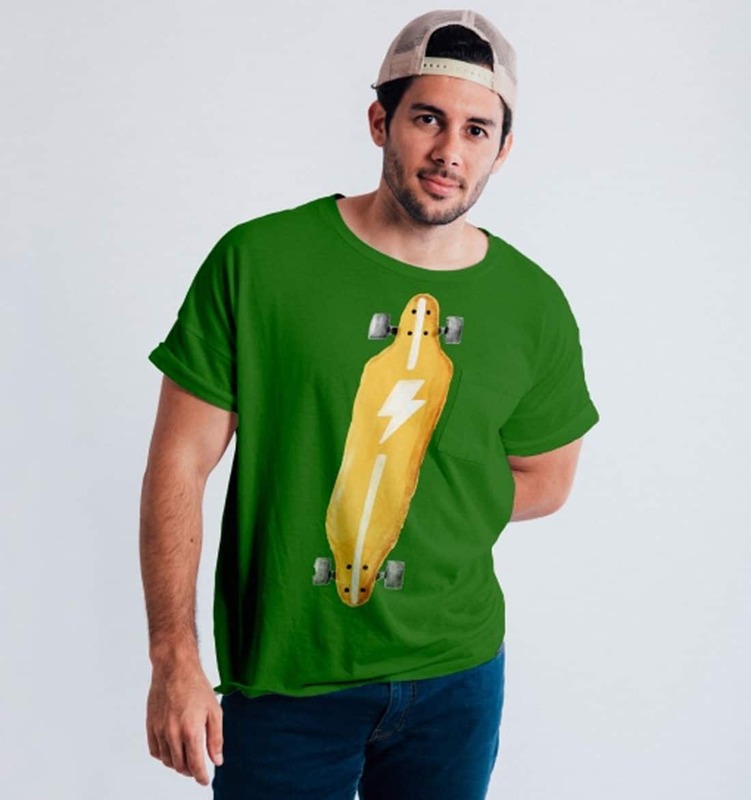 The designer had aligned the layer perfectly to match the orientation of the t-shirt, so you get a more natural looking t-shirt model. All you have to do is to change the existing t-shirt design with yours and resize it to fit within the mockup. Casual looking men’s round neck T-shirt Mockup. If you are an apparel store that is selling clothing and accessories, models like these will help you promote your accessories as well. On the clean light background, the colorful t-shirt looks vibrant. The clean background also makes the t-shirt look attractive and distinct from rest of the properties. Perfectly aligned layer helps you to create a more natural looking t-shirt model. 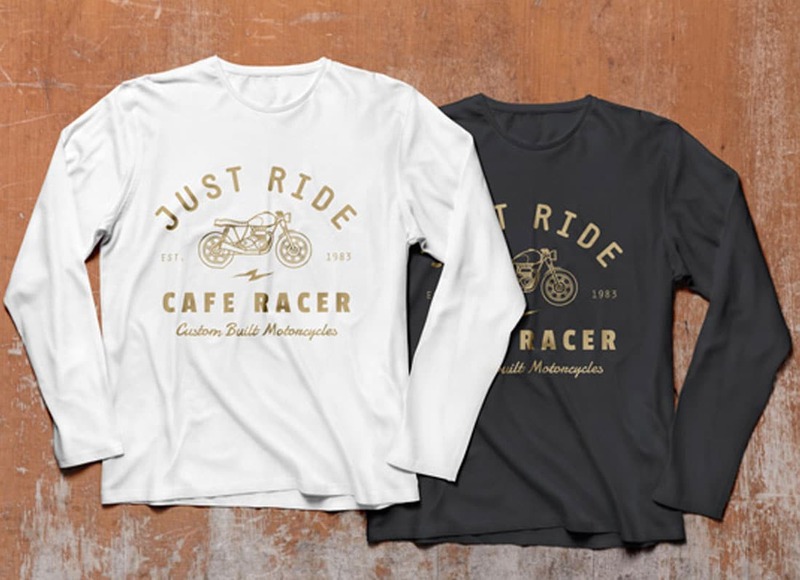 This day to day usage style t-shirt mockup gives a casual look to your t-shirt. The t-shirt used in this mockup has a pocket, so make sure to check this before using this mockup. With the clean background, this mockup highlights the t-shirt design elegantly. This mockup can handle both the full body design and sleeve design. This mockup is also from the creator of the fourth variation mentioned above. Like the above mockup design, this mockup also has the same model and same posture but in a different angle. The preference is purely based on your t-shirt visibility, both the mockup images are taken under perfect studio lighting condition. Whichever version you feel comfortable with, you can choose that one. As both the mockup are from same creators, you get the same quality and editing experience. It is a fully free premium quality mockup for your designers and store owners. 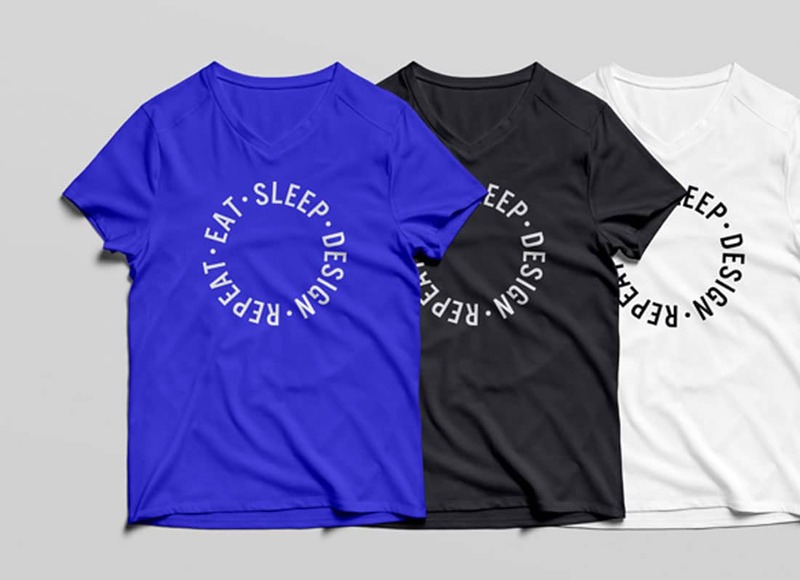 With the circular shadow design, this mockup neatly highlights your t-shirt design elegantly. If you need you can remove the dark edges and make the design look plain and simple. Well, structured layers make customization easy for the end users. To edit this mockup you might need Photoshop version of CS4 and above.